The Aspall Tennis Classic could not be possible without the support of our family of luxury and premium partners. Innovation and invention have been at the heart of Aspall ever since Clement Chevallier arrived at Aspall Hall in 1728 to set up his new cyder business. Now one of the oldest family businesses in the UK, Aspall is run by the eighth generation of the family, Barry and Henry Chevallier Guild. While upholding the same exacting standards set by Clement nearly 300 years ago, the business has continued to innovate and improve. Today, with its immense heritage, Aspall is recognised as a brand that values its past while embracing new ideas and technologies. Rolls-Royce models like the Phantom, Ghost, Wraith and Dawn are a familiar sight in Mayfair, home of Rolls-Royce Motor Cars London. Part of the H.R. Owen Group, the Berkeley Square dealership can trace close ties with the Spirit of Ecstasy back over 85 years; in 1932 Harold Rolfe Owen opened his first dealership, representing Rolls-Royce, in nearby Berkeley Street. A commanding figure with a distinguished military record, Captain Owen famously made friends of his customers, and customers of his friends. The tradition continues to this day, and Rolls-Royce Motor Cars London celebrates its status as Europe’s leading Rolls-Royce dealership. Marriott Bonvoy is Marriott International’s travel loyalty programme built on the belief that travel enriches peoples’ lives and the world around them. Comprised of a portfolio of extraordinary hotel brands, where you can earn and redeem points, as well as over 120,000 destination tours and adventures, the programme enables members to explore the world in pursuit of their passions. Members can also redeem their points for extraordinary sport, entertainment, culinary and lifestyle experiences via Marriott Bonvoy Moments. These include VIP Matchday Hospitality for the Aspall Tennis Classic at the Hurlingham Club. 30 hotel brands. Endless experiences. Rewards reimagined. JOIN FOR FREE AT MARRIOTT.CO.UK. Scott Dunn is a luxury tour operator and has been creating tailor-made holidays and honeymoons to amazing destinations all over the world for over 30 years. They have been voted Favourite Specialist Tour Operator by the readers of Condé Nast Traveller for six years in a row and hold guest service at the heart of what they do. Not only does Scott Dunn create bespoke itineraries that are suited to guests’ preferences, they also operate their own fully staffed luxury ski chalets in the Alps and family villas in the Mediterranean with a choice of service levels. Scott Dunn also has 11 Explorers kids clubs across the Mediterranean, Alps, the Maldives and Mauritius which look after and entertain the youngest of guests from 4 months upwards. The team at Scott Dunn understand that when kids are happy, parents have the best opportunity to relax and unwind – and whether you are looking for a family break, honeymoon or far-flung adventure, they take time to understand what you enjoy so they can create the perfect holiday tailored specifically for you. For more information please visit www.scottdunn.com or call 020 8682 5000. Harrogate Water continues an illustrious heritage of providing naturally sourced spring water and the benefits of healthy hydration for people to enjoy since 1571. As ‘The Original British Bottled Water’, Harrogate is Internationally-renowned as one of the finest still and sparkling spring waters. Awarded ‘Best Sparkling Water in the World’, Harrogate is recognised not only for its exceptional mineral balance and purity, but also for its distinctive, classically British style. A responsible manufacturer, Harrogate Water Brands is committed to sustainable production practices, working in partnership with Keep Britain Tidy. It operates a zero waste to landfill facility, sources all components from within a 90 mile radius and ensures all bottles are 100% recyclable. Glass and PET plastic bottles are made from at least 50% recycled content – the most of any UK bottled water brand. 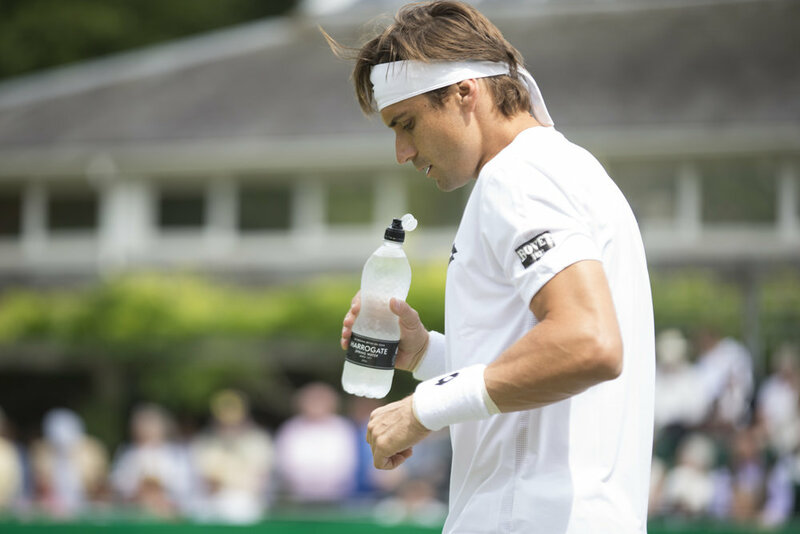 The Aspall Tennis Classic at Hurlingham provides the perfect platform for your brand to engage with an affluent audience in an exclusive setting and align with tennis at a time where the sport is at its most magnetic in the UK ahead of Wimbledon.